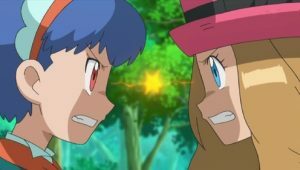 On the road to Pomace Mountain, Ash and Korrina are having a battle. 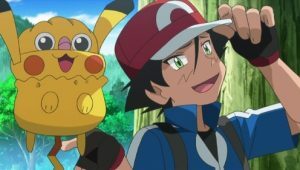 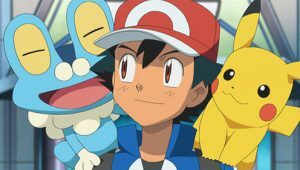 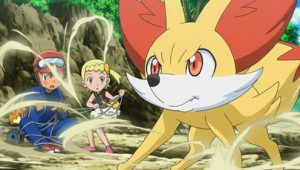 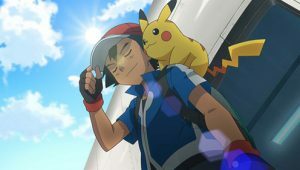 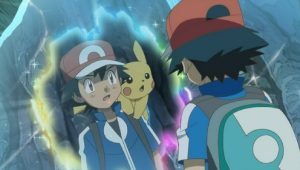 Ash’s Pikachu uses Thunderbolt, which Lucario dodges. 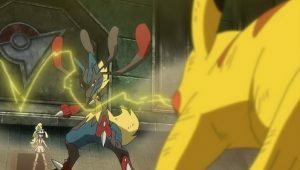 Lucario then retaliates with Bone Rush, which Pikachu dodges. 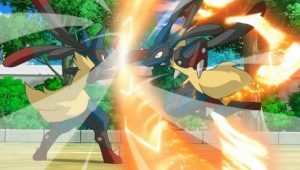 Pikachu then attacks with Iron Tail, which Lucario counters with Power-Up Punch. 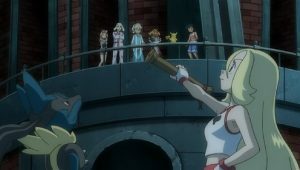 Korrina exclaims at Lucario’s choice of moves, only to quickly realise that she had not commanded Lucario to attack. 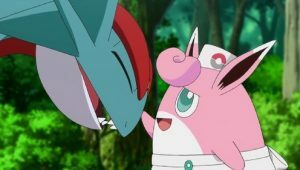 The battle soon ends with Bonnie announcing that lunch is ready. 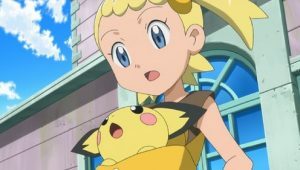 During lunch, Serena passes around some Poké Puffs for Lucario as well as for Dedenne and Pikachu. 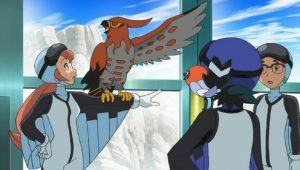 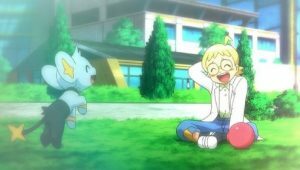 Ash then asks Korrina about what training Korrina and Lucario had done since their childhood. 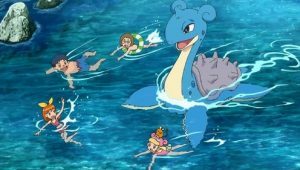 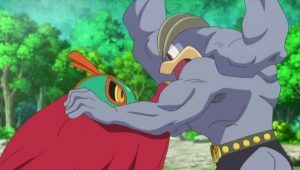 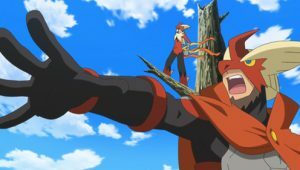 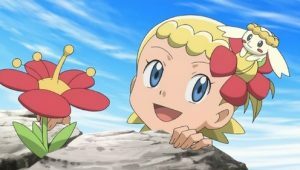 Korrina replies that she had battled her grandfather and his Lucario on several occasions, and also reflects on having battled a Trainer with a Mega Ampharos. 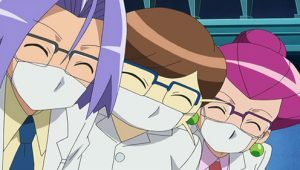 Meanwhile, Team Rocket are eavesdropping on the group, listening in about Mega Ampharos. 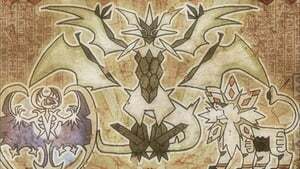 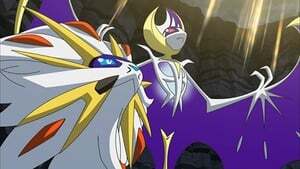 The trio then plot to steal Korrina’s Lucario, her Lucarionite and Key Stone. 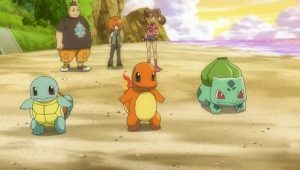 The next morning, the two groups attempt to find each other. 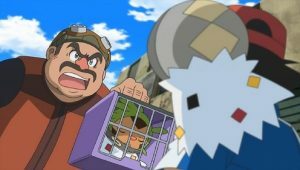 However, at Clemont’s group, Team Rocket intervenes, trying to capture Pikachu in a net which Pikachu narrowly avoids. 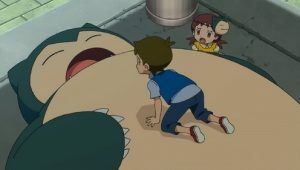 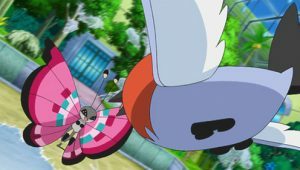 Clemont takes out Bunnelby, only to face a powered-up Inkay, Pumpkaboo, Meowth and Wobbuffet, armored with their “Mecha Evolution Power-Packed Amplify-O-Rama Mark 2”. 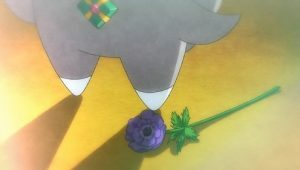 Bunnelby faints after being hit by Inkay’s Psybeam and Tackle, and Pumpkaboo’s Dark Pulse. 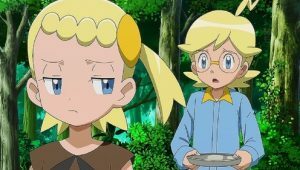 Clemont then takes out Chespin, only for Chespin to also get badly hurt by Team Rocket’s powered up Pokémon. 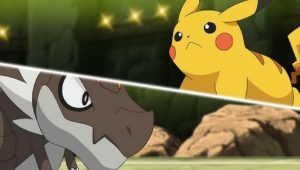 Pikachu joins the fight with Thunderbolt, only to be countered by Wobbuffet. 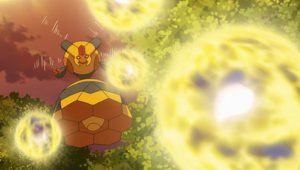 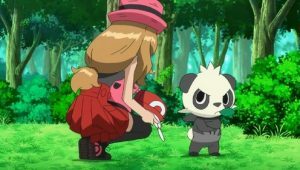 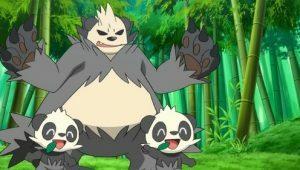 Korrina then commands Pikachu to use Quick Attack and Iron Tail, which are dodged by Inkay and Pumpkaboo respectively. 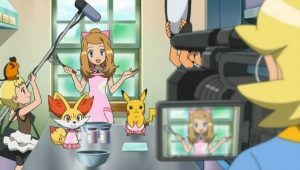 Korrina then commands “now Pikachu” without stating a move. 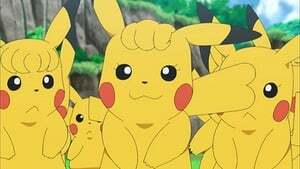 Pikachu, confused, gets hit by Pumpkabo’s Shadow Ball. 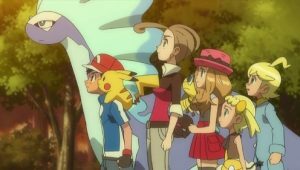 Meanwhile, Fletchling has found Clemont’s group, and leads Ash, Serena, Bonnie and Lucario to the others. 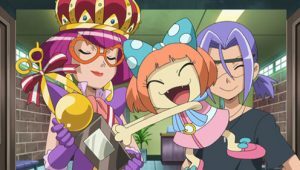 Back with Korrina, Meowth comes in to attack Korrina to steal her Key Stone. 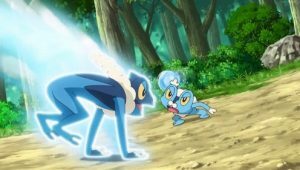 However, at the last minute, Lucario comes in to block Meowth’s attack. 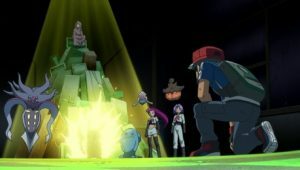 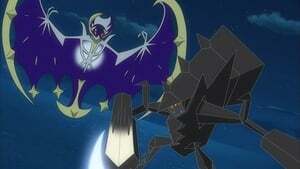 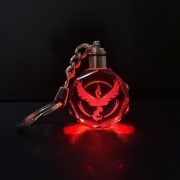 The battle then continues between the group and Team Rocket. 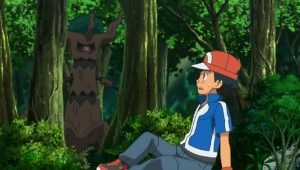 But as Ash and his group are losing, Lucario prompts Korrina to allow it to Mega Evolve. 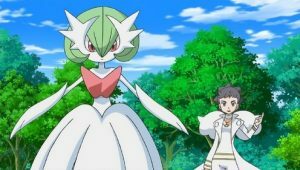 Despite some misgivings, Korrina decides to Mega Evolve Lucario. 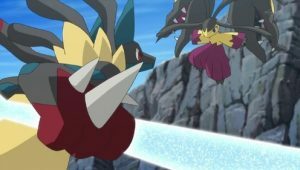 After Mega Evolution, Lucario attacks with Bone Rush, successfully hitting Pumpkaboo. 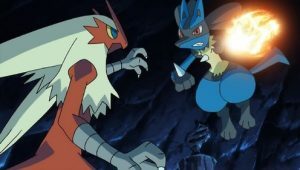 However, Lucario subsequently loses control and begins to start attacking Ash and the group. Korrina tells Lucario to stop, but Lucario charges forth towards Korrina, stopping just before attacking Korrina because of her voice. 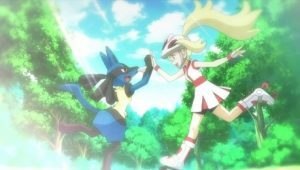 Korrina continues to shout Lucario’s name, and Lucario begins to regain control of itself. 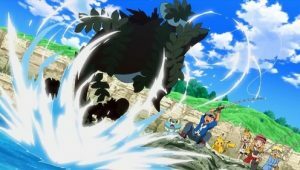 Lucario then attacks Team Rocket with Bone Rush, causing them blast off. 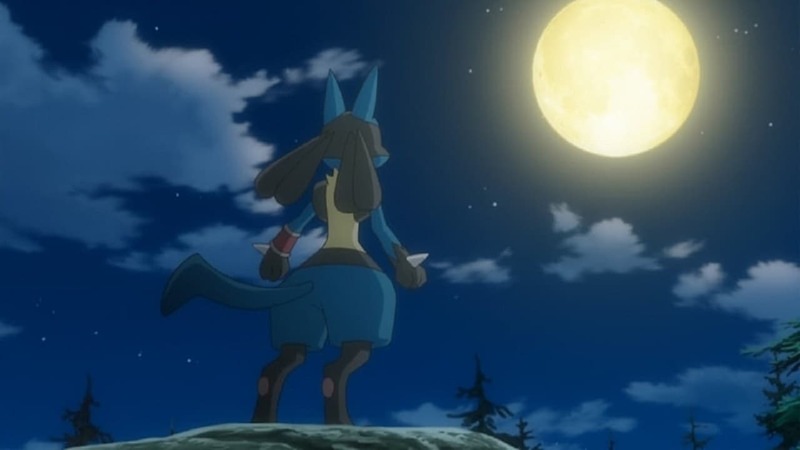 However, Lucario then loses control momentarily before fainting from exhaustion. 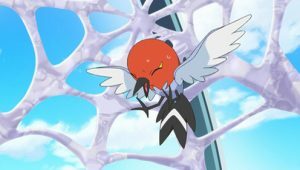 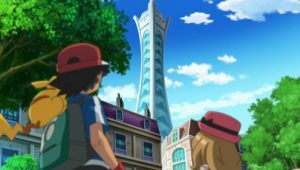 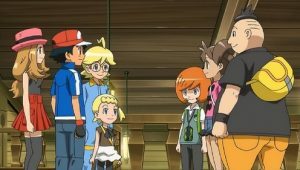 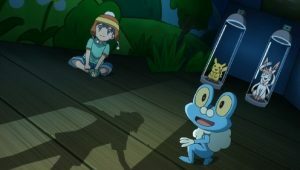 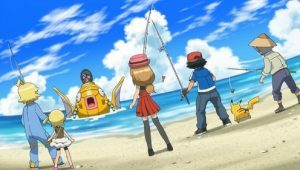 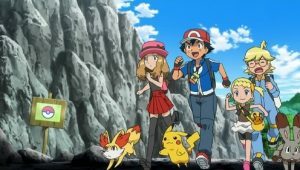 At this, Clemont comments that they still have some way to go, though Ash believes that they will be able to figure it out.